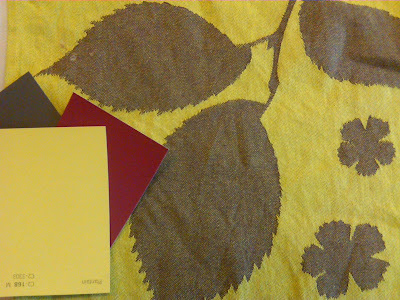 Susan, a Daly's Paint & Decorating customer, came in with a gorgeous tea towel the other day - she wanted to paint her kitchen with a unique color combination - and her towel was the inspiration. The towel is in greens and browns, with a hot pink accent thrown in at the edge. She didn't want to play it safe, she was ready for some fun. Color is such a great way to make a change, and I loved what we came up with, and I wanted you to see her fabu colors. Daly's Paint and Pratt & Lambert - A Colorful Connection! 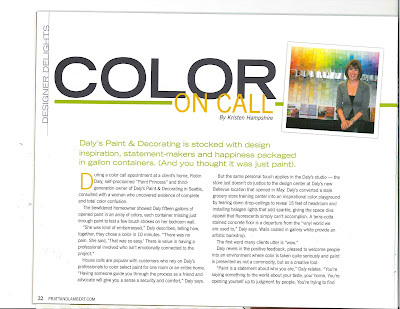 I want to share with you an article that just appeared in Pratt & Lambert's Personal Expressions magazine. 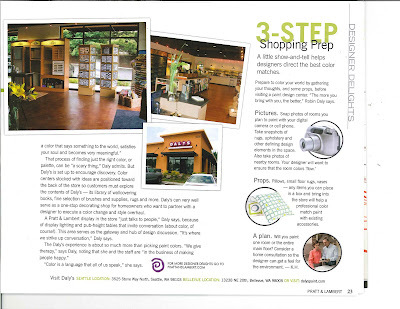 Featured is our NEW Bellevue Daly's store - we are so proud of it, and very pleased that P&L thought it looked good enough to put in their national publication. 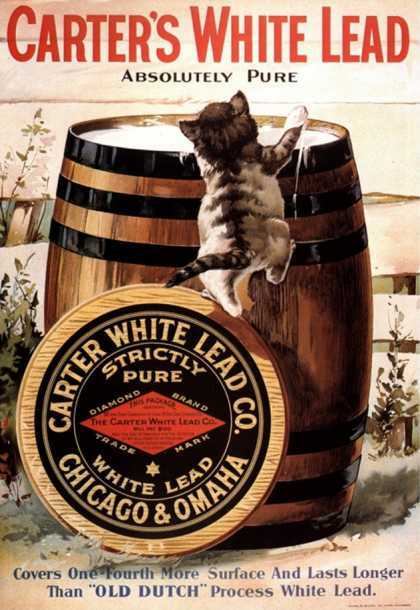 This ad was from Cater's Paint, dated 1910. What a difference a century makes!!! Facebook Daly's Paint & Decorating: " In-laws coming? Uninspiring guest room? Blah bathroom? Here's my favorite spruce-up trick...The Feature Wall. Instead of repainting an entire room, find a lovely color and paint it on one wall only. This is a great way to create a focal point (and a favored trick to redierect the eye from flaws in the room) and it adds... a fresh look without too much effort. (I'm all about avoiding TOO MUCH EFFORT during the holidays!)" Most paint chips aren’t made from paint. Shocking, isn’t it? With the exception of C2 Paint, most national brands have their chips printed with ink – and ink is a transparent medium while paint is an opaque one, and light interacts differently with these two mediums. Therefore it is almost impossible to replicate the color on the sample chip to the color that comes from the can. If you have ever wondered why the color on the chip didn’t match the color on the wall, now you know. Color chips have another disadvantage – they are small. When you look at the size of even a single wall, you quickly realize that a paint chip is too small to accurately give you an impression of how the color will play in a full-scale setting. If you understand that color chips are very handy tools to take you to the next step, they can be very useful. Color chips provide a very quick method for winnowing out the obviously wrong colors and finding those three or four colors that might work. Your next step is to sample the actual color. Before we roll on some color, let’s look at one more issue: Lighting. 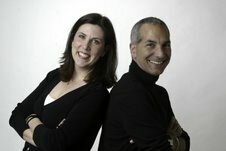 If you are trying to make a color choice while standing in a busy paint store or staring at some samples on a computer screen, you are at another disadvantage because you are not looking at your color under the correct lighting conditions. Preferably, you want to see what happens to your paint color in a series of lighting situations – morning, noon and evening. Each of these different times of day affects the way the color reads, and you want to make sure you like it at all times. Sometimes a color will ‘mud out’ at night (we can spend a lot of time discussing tinting recipes and why this happens… but later), or intensify to the point of looking neon, or wash out and look almost white when you thought it would be a soft taupe, or you find that charming coffeehouse color looks heavy and sluggish. Color does not always do what you expect it to. And if you live in a grove of trees or near the water, testing becomes imperative. Ideally, you want to try your color with the other design elements that are going into the space like sofas, rugs, art, etc… C2’s Ultimate Paint Chip, which is a poster-sized chip made from real paint, is one option if you aren’t ready to get paint on the walls, or you can try a 16 oz. Sampler or Test Quart of paint (depending upon the brand you are using). Paint AT LEAST an 18’ x 24’ patch on the wall. More if you can. Apply the color on the darkest wall, the lightest (usually opposite a window), and in a corner. This allows you to see your color in all room and lighting situations. Another major benefit of testing your color - it keeps those unfortunate color mistakes from becoming landfill. And we can all feel good about that! "Mostly Sunny" weather means Squeeze In One Last Outdoor Project In Seattle!!! This week is shaping up to be 'mostly sunny' - that's good news if you want to winterize the deck or get that front door painted before the rainy weather hits. Ideally, you want to paint outdoors when there is lower moisture, medium temperature and indirect sun... Luckily, today's exterior paints are formulated to be applied in less than ideal weather. Just because the paint is dry to the touch does not mean the entire paint film has cured. When you are painting in these shoulder seasons, you will have a longer cure time. In other words, you might need to wait longer between coats. It is best to paint when the morning dew has evaporated - this might mean waiting until late morning (or later) for better painting conditions. Daly's wants to help you get your fall design projects off and running. So we are waiving our normal $75/hr consultation fee for the month of September! Our staff designers work with you one-on-one to create paint color schemes, window treatments, wallcovering and upholstery projects. Normally we charge an hourly rate of $75, so call us by the end of the month to set up you appointment. Expect your consultation to last from an our to an hour-and-a-half. It's fun and takes the stress out of decorating! 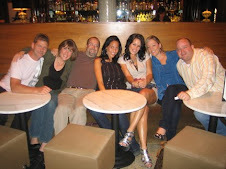 Our Bellevue Crew is Serious About Helping You!!!! Can I Touch Up a Swedish Finish Floor? Many people have what is typically called a 'swedish finish' on their floor; it is known to be very durable and beautiful. But sometimes that floor starts to show wear and in the past there weren't many options - except refinishing the entire thing. This has been one of the biggest drawbacks to the swedish finish approach, it is an all-or-nothing proposition. Also, the chemicals used to make the finish are very strong and for safety reasons only contractors are supposed to apply it. Today I was working with a customer who has a kitchen floor that desperately needs attention, but refinishing wasn't an option. Luckily, we have a good solution, and I want to share it with you, too. The product we recommend is Daly's Satinthane. Satinthane is a ure-alkyd, meaning its a combination of urethane and alkyd (modified with oil), instead of the typical straight alkyd. This allows the product to adhere to the existing finish where others can't. All urethanes are not created equal. You must open up the existing finish first. This is where most people make mistakes, and this can result in failure, regardless of the top coat product. We suggest 220 sandpaper or screening paper to 'scratch the back' of the Swedish finish. This gives the new product something to grab onto and helps to keep it from peeling or blistering off. Make sure to vacuum and damp mop any dusty residue. You want your surface to be as dust-free as possible for the best possible finish. The Daly's Satinthane is applied with an pad applicator, and then you can tip it off with a brush on the edges. 2 coats is best, 6-8 hours between coats, 24 hours to walk on and a couple weeks for full cure. Don't forget to work in a well-ventilated space. Like any oil finish, Satinthane may amber over time. The best thing about switching to Satinthane is that going forward maintenance is much easier and it can be refreshed with more Satinthane or Daly's FloorFin. When you get to that point, scuff it up, dust off and apply a thin coat of finish. Done! Teal!! Can you believe it? I believe it. It took a loooooong time for it to show up again!